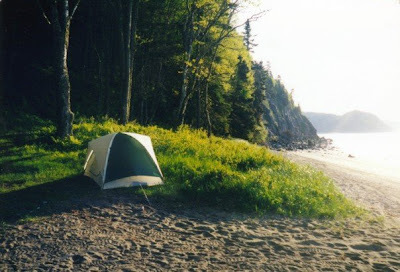 There are camping or backpacking trips where your tent is like your best roommate on a bad week. When you are trapped for a full day in a tent due to bad weather you want to make sure you have a well designed tent, or great roommate. So what makes a great tent on a bad week? Like all good roommates, your tent knows when to give you space. A well designed tent has lots of headroom and a spacious vestibule for gear storage. This will make your bad day seem a bit brighter. I had a roommate once who was great at weathering my occasional rainstorms. My tent should do the same. A bad day can get worse if; when you open your door the rain gets in on your sleeping bag; or when your temper heats the tent and you get enough condensation to soak your last pair of dry socks. My best tent breathes well. It regulates the interior temperature without a lot of effort on my part and this reduces the amount of moisture build up. Most importantly though, it just does not leak, even during the heaviest rains. A seamless relationship between you and your roommate depends on how well you blend together. Again, a good tent needs well blended seams to be effective. Stitching is crucial in providing a durable, waterproof tent. Even better, would be no seams but then where would you put your poles? Strong stitching around your pole loops is important and light weight poles make that wet tent a bit more bearable when lugging it back to the trail head. A good roommate knows when to cover for you just like a good tent has a tarp that provides that extra cover when you need it. I like a tent that has a full tarp with a large vestibule. The tarp should also have a large door for easy entry and exit this will also allow the tent to be aired out on warmer days. If you can tie your tarp out from the tent frame it will allow it to breathe better as well. I’m sure you have wished you could tie up a roommate once or twice on a bad day. Now, I know your tent isn’t a roommate but rather a room. Trust me though, on a cold, rainy, day you will get more intimate with your tent than you wish. Like I said about boots, you need to know what your needs are when tenting. If you are a car camper, I would go with a larger, heavier tent. If you are a backpacker, then you need to strongly consider weight and may want to sacrifice space to minimize the weight you have to carry from campsite to campsite. A tent also needs maintenance in order to keep you happy and live a long life, again a lot like a good roommate. It is important to dry your tent out and clean off the floor and tent walls after every trip. This will prevent build up of damaging fungus on the tent materials so that the tent can more readily withstand the next stretch of bad weather. It would be terrible if a pole snapped in a wind storm and ripped your tarp and let the rain in on your sleeping bag.